Among the 3 tools mentioned above, Google Analytics is the only tool that gives accurate reports. Google Search Console and Alexa are not 100% reliable tools but I still use them quite often. Why Alexa is not a reliable tool? Alexa is a ranking system that gives traffic information about all the websites it has discovered. However, this system does not have any mechanism to collect the accurate traffic data of the websites. It simply uses the data it collects using the Alexa toolbar (and similar tools) installed by many people and uses such sample data to generate traffic ranking for all websites. The drawback of this system is, if a particular website is not included in the collected sample data, then that website will not get a place in Alexa Traffic Rank system. The websites which are regularly visited by the people who have such tools will get higher ranking. The websites which have readers with no such tools will get poor ranking just because Alexa doesn't get much traffic data for such sites. So, what's the best way to increase your Alexa rank? As you can guess, just get your website regularly visited by the people who feed the sample data (Alexa toolbar users). Or, get the Alexa toolbar installed by your regular visitors so that Alexa will get a lot of traffic data about your website, which will make it think that your website is visited by a lot of people. The biggest disadvantage of Alexa ranking is, it is highly favored towards websites which have a large webmaster/SEO audience. This is because such audience are usually aware of Alexa toolbar and are most likely to have the Alexa toolbar and other similar tools installed. Websites that provide content for webmasters and bloggers usually have relatively high Alexa rank. The reason is simple - a good number of their readers are webmasters and they use Alexa and other toolbars which feed sample data to Alexa ranking system. If you run an SEO tutorial website, most of your readers may have Alexa toolbar and your Alexa rank will be much better than other websites which talk about health or programming since those readers may not have such toolbars to supply data to Alexa. Tip: Read tips to improve the Alexa rank of your blog. I was trying to do a case study on the Alexa ranking system and I could not find a better candidate than shoutmeloud.com, a popular Indian blog delivering quality content on blogging, SEO and webhosting. Visit Shoutmeload for more information. One of the main reasons I chose ShoutMeLoud.com for my case study is, it has an unusually high Alexa rank and the owner of the blog publishes its actual traffic statistics, which I can use to compare with the Alexa reports as well as stats from my own websites.Click here to find the ShoutMeLoud traffic data . Here is a screenshot, just in case the page on ShoutMeLoud changes later. The above image shows ShoutMeLoud has a global Alexa rank of 2596. This means, according to Alexa, there are only 2,595 other websites in the world that receive more traffic than ShoutMeLoud (as per the Alexa report). Also, the traffic rank in India is 262, indicating this site is really popular in India. But how far is this true? According to the traffic statistics published by the same site, the site received 675,365 page views (June 2015). From my personal experience with Harsh Agrawal, the man behind ShoutMeLoud, I believe the traffic data published on the website is reliable and accurate. I am sure there are hundreds of other websites on the internet with millions of page views every month. So, why does ShoutMeLoud have such a high Alexa rank? The reason is simple - Almost 100% of the readers of this website are webmasters, bloggers and SEO professionals and a good number of them use tools that provide data to Alexa ranking system. For the same reason, Alexa receives a lot of traffic data about this website. Since this website has a huge presence in the sample data received by Alexa ranking system, it thinks that this website has a relatively high volume of traffic and thus ranks really high. 1. ShoutMeLoud.com - a site with very high Alexa rank. 2. Techulator.com - a site owned by me which has about the same traffic as ShoutMeLoud but has relatively poor Alexa rank. 3. dotnetfunda.com - this site is a competitor of my site dotnetspider.com but I chose this site for the case study since it has the same level of traffic as ShoutMeLoud but has extremely poor Alexa rank. The owner of this site was kind enough to share his Google Analytics reports for this case study. 4. 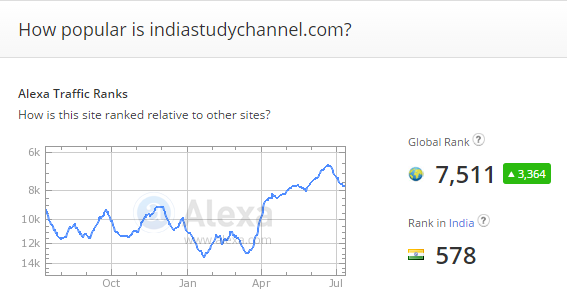 IndiaStudyChannel.com - one of my sites with about 8 times traffic than ShoutMeLoud but comparatively low traffic rank. Let's compare the stats and ranking. The income report for ShoutMeLoud for June 2015 can be found here, which is a very interesting and inspirational post for bloggers. Click on the thumbnails above to see the screenshots of Alexa rank as of 15 July 2015 for all the sites compared. The above screenshots were taken on 15 July 2015 but Google Analytics reports provided are for the month of June. For Techulator, dotnetfunda and IndiaStudyChannel, the traffic pattern remains the same for June and July. I am assuming traffic is not significantly changed for ShoutMeLoud also during this month. Let us analyze the stats shown above. ShoutMeLoud and Techulator have pretty much the same volume of traffic but their Alexa traffic ranks are significantly different. Techulator (16.8K) has relatively poor Alexa rank compared to ShoutMeLoud (2.6K) because only a small portion of Techulator audience are Alexa toolbar users. IndiaStudyChannel received about 8 times more traffic than ShoutMeLoud but it still has much poor Alexa Rank compared to ShoutMeLoud because it has very minimal traffic on SEO/blogging related topics. - Alexa rank is highly influenced by the nature of the audience of the website. - If readers of the website have Alexa and similar toolbars that feed data to Alexa system, it will have relatively high Alexa rank. - If the readers of the website are unaware of the webmaster related toolbars, such websites will have relatively lower Alexa rank. - Alexa rank can be reliably used to track the progress of a website as long as the audience of the website remains pretty much the same. - Alexa rank can be reliably used to compare websites with a similar audience. It cannot be used reliably to compare websites in a different niche. - There are occasions where Alexa rank shows variance in the traffic level but the actual traffic remains the same. But from my experience, this is a rare scenario. I mentioned in the beginning of this article that it is one of the few tools I use. You may be wondering why I am still using when I am trying to prove this is not a reliable tool. I'm primarily using Alexa rank only to track the progress of websites or to compare websites in the same niche. Also, I use this too to see the impact of certain Google algorithm changes on competitor websites. After a Google algorithm update, if the Alexa rank of a third party website shows significant variance, I can use that data to analyze how the algorithm update affects websites. Since there are no other reliable tools to check the progress of other websites, this is the only option for me to measure how the traffic of specific websites vary over a period of time. Hope this case study gives you a clear picture of how reliable is Alexa traffic rank. What is your take on this ranking tool? Do you trust Alexa rank? Share your thoughts as comments below. As Alexa rank of a website to its webmasters is of great concern. Here, we are providing the very effective ways to improve the Alexa ranking of a website.To improve Alexa rank of your website within few months , just go through this article and follow some of very effective ways. You are right. I have searched my site several times on Alexa but every time depressed. When I searched the results of traffic in Google Analytics, different data flashed there. I think only focus to write the original content with relevant Keywords. The traffic will automatically enhance. Thank you for your feedback. If you see good traffic in your Google Analytics, you don't need to worry about your Alexa rank. The Alexa rank becomes important only if you want to approach your clients based on your ranking. Sadly, many PR companies and clients still depend on the Alexa rank to measure the popularity of websites since there are not many other reliable methods to check the ranking of third party websites. As I mentioned in the article, the ranking can be used to track the progress of a particular website, whether it is your own or someone else's. For your own website, your Analytics report is more accurate than anything else. Thanks for your post and for clearing all doubts related to alexa rank.